Russell County Animal Shelter is a small rural facility in the southwest of Virginia. Thanks to our rescue partners and adopters, Russell County Animal Shelter does not euthanize dogs to make space for incoming strays. We are also fortunate enough to work with some amazing rescue groups and dedicated individuals who help us move animals to safety each and every week. For more information see the Russell County Animal Control website and Fequently Asked Questions. UPDATE April 15th: Today is such a happy day, Phoenix went to his forever home! We are so very thankful for all of the support and love that the community has shown for this precious boy. We are excited to see him continue his journey. He will now have three Great Danes and a Chinese Crested as siblings. We hope to get a new family photo once he settles in. This poor baby is Phoenix. He was brought to the vets office by a Good Samaritan who found him abandoned at the trash dump on Gravel Lick Rd. 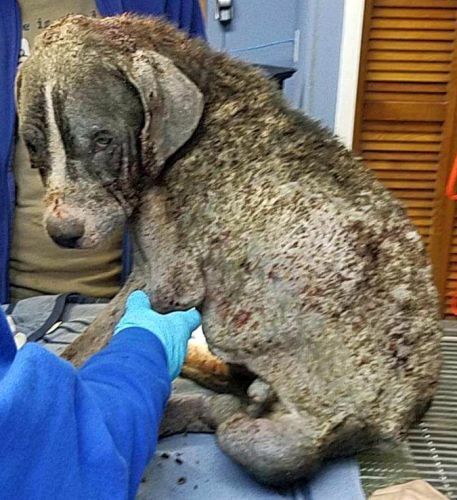 He is suffering from severe mange (caused by starvation) and extreme malnutrition. He cannot walk at this time due to not being strong enough from the malnutrition. He is getting excellent veterinary treatment. 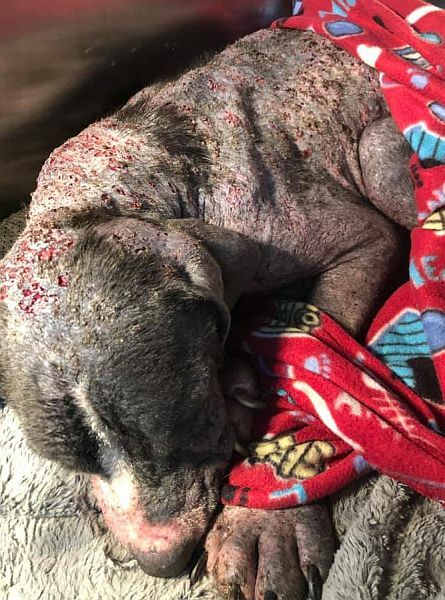 If you would like to donate to help with his vet bill contact Southwest Virginia Veterinary Services in Lebanon, VA. Their address is 309 Overlook Dr. Lebanon, VA 24266 or call them at 276-889-5515. Please pray for Phoenix as he recovers. Also if you have information on who abandoned Phoenix at the trash dump please contact the Russell County Sheriff's Office at 276-889-8033. Click on the photo to see a larger version. See updates on our Facebook page. Stray dogs without identication are kept for 7 days before being put up for adoption. Dogs with identication are kept for 10 days before being put up for adoption. Contact the shelter to check whether your pet is there. Some of the stray dogs are featured on the Russell County VA Animal Shelter Facebook Page but not all are put here so contact the shelter if you have lost your dog. Russell County Animal Control does not take in cats. Russell County Animal Shelter will keep a dog for 7-10 days so that the owner can claim it before we can put the dog up for adoption. If you are interested in a particular dog before its available date please contact us. 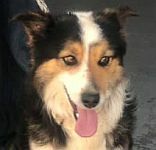 We would like a dog to go to a new home or rescue as soon as possible after its 'available' date. All dogs kept in Russell County must have a license. Dog licenses can be obtained at the Russell County Treasurer's Office or by mail to the Treasurer's Office. You must have proof of rabies vaccination to purchase a dog license. 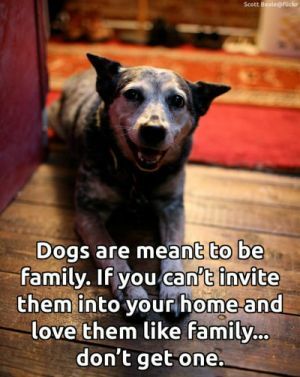 If you have any questions about adopting a dog, please call the shelter and speak with a member of our shelter staff who has daily interaction with our dogs. You can reach us at 276-415-9163. If it is after hours, please leave us a voicemail. Our hours are Monday-Tuesday 10am-4pm, Wednesday 10am-3pm, Thursday-Friday: 10am-4pm or you may send us a private message on our Facebook page. We need towels, blankets, hard and soft dog food, basic cleaning supplies and dog beds or you may mail a donation to Russell County Animal Shelter, 458 Haber Dr, Lebanon, VA 24251. On behalf of the dogs thank you. Location Map of Lebanon, VA.